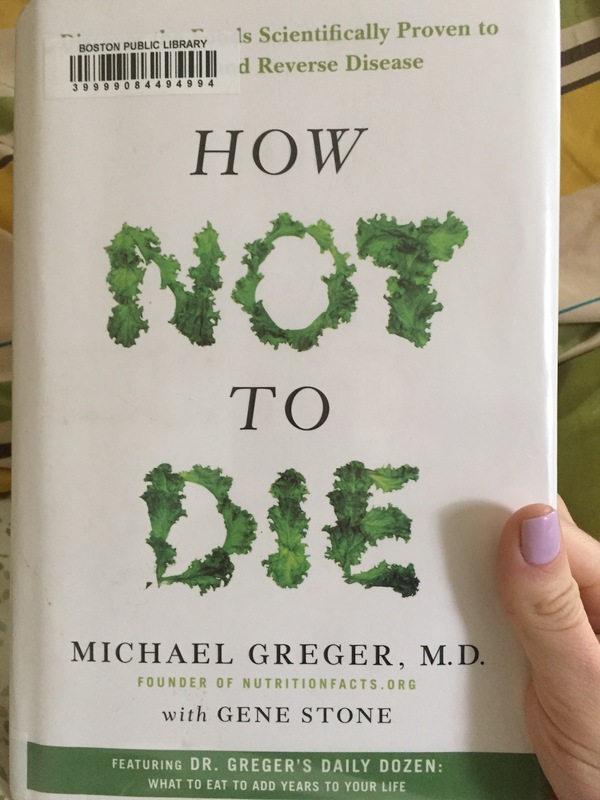 I know I’m a bit late to the game, but you should cut me some slack because I’ve been waiting about 3 months to get my hands on Dr. Michael Greger’s new book, How Not To Die. In an effort to cut down spending, I requested the book through my local library – apparently along with many other people – and therefore had a seriously long wait before I finally got to the top of the waitlist. 2. Well organized layout. Each chapter provides a narrative and well-researched outline of “how not to die” from the top 15 leading causes of death. There is also a section on Dr. Greger’s Daily Dozen which includes info on a dozen habits to include in daily life for nutritious and healthy living. I’m only 45 pages into the book currently, so I have a long way to go. But so far, it’s an interesting read. I would suggest it to anyone looking to inform themselves about the importance of a plant-based diet, whether you’re already consuming plant foods or not. Vegan Podcast : Must Listen! As of a few months ago, I was not one to listen to podcasts. Then – for whatever reason – I was looking for something to listen to in the car when I decided to search up podcasts that had to do with veganism. On this lucky day, I discovered Colleen Patrick-Goudreau’s podcast Animalogy. If you love animals, literature, and being vegan (or even if you’re thinking about veganism), then you NEED to listen to this podcast. Colleen Patrick-Goudreau combines veganism and literature by looking into and discussing the animal-related words that we use every day. So far, I must say, that I have been totally enthralled. I’ve learned so much about goats, falcons, crows. and cuckoos! If you’re interested in listening, head over to the Animalogy Podcast website, here. And let me know if you enjoy it too! Its been several weeks since the Spring Cleaning series began. At this point, hopefully you have set goals and begun to map out ways to achieve them. Maybe you’ve encountered some barriers and are using the three tips from last weeks post to tackle them. Or maybe this the first post you’re reading, and you have no idea what I’m talking about! In any case, I thought I would go back and summarize the Spring Cleaning series into one short post to tie things up. So you’ve created your goals. These shiny new goals might be written in curly script or on a beautifully organized list, but if we don’t move into action, then the goals won’t help us get anywhere! Taking action could be scary for you – or it could be exciting! However you are feeling, it’s important to recognize that if you don’t take the first step toward your goal, you won’t be able to start the journey of making change. Today, let’s think about the barriers that block us from taking action and how we can support ourselves in the journey toward achieving our goals. I’m sure everyone has, at one point in their life, heard of SMART goals. No, these aren’t goals with brains; instead, they are goals that are specific, measurable, attainable, realistic and time-based. I don’t know about you, but creating goals that satisfy each of those requirements can actually be pretty difficult. It takes a lot of effort to hold all that information in your head – and if you’re like me, when it’s that hard at the beginning I’m more likely to give up before I even get started! In today’s post, I’ll share with you a tool that I’ve created to help me wrap my head around the process of crafting goals. I’ll also be sharing my personal set of goals for this spring-cleaning season. Its been a week or so since my last posting. And I know I have ‘messed up’ and ‘ruined’ my streak of posting twice a week. But I also know that life happens sometimes and even my best intentions have to take a backseat. But here’s a secret – failing is the only way that we really learn. Clearly I was struggling to post twice a week (even though I ideally wanted to post even more than that!) because I have a difficult full-time job, I am committed to going to the gym for self-care, and I have a partner that needs attention too. So I’m going to practice a little bit of self-forgiveness and move on from this slip up instead of letting it completely discourage me from ever trying to blog again. So here’s to messing up and trying again. I’ll be back with a quality post for my Spring Cleaning series on Sunday. I guess I had some spring cleaning of my own that needed to happen before I could really sit down and create content. Back again with the next 4 domains in our journey to Spring Cleaning! As we discussed last time, the assessment that I used to assess what areas of life could be in need of some decluttering listed 7 domains of wellness. They are…physical wellness, social wellness, emotional wellness, environmental wellness, occupational wellness, spiritual wellness and intellectual wellness. Putting effort into supporting each of these domains will help you to lead a balanced and happy life – for the most part! We all know that there are bumps in the road, but that’s a post for another time. Let’s get into the last 4 domains and some ideas about how you could support each of them.